Concept Systems, Inc. As a company evolves, a brand's perception may be out of alignment. We helped CSI develop a new brand focus so they were properly positioned to jump-start the next phase of their marketing growth. When the company was founded nearly twenty years ago, CSI was a pioneer in developing its proprietary Concept System® mapping software. Over the past two decades, Concept Systems, Inc. has matured to offer so much more-methodologies that help organizations build consensus by helping its clients’ stakeholders achieve buy-in with concrete and useable results. challenges have been identified. When a company evolves, as CSI has over the years, the overall perception of the brand may not be in step with what the company is today. Concerns have been raised as to how well the target actually understands what CSI does and whether or not CSI’s software is perceived as different from competitive products. Further, CSI has not had a consistent marketing plan in the past which may have hindered whatever marketing efforts – including a website re-design, direct mail, email newsletters, and more – had been recently undertaken. Our task as strategic thinkers, writers and designers was to express Concept Systems, Inc.’s essence and attributes to their client base by telling the company’s story in a compelling way. We applied a comprehensive and customized process to help CSI develop a stronger brand presence, thereby helping them improve their marketing. What CSI’s competitors are saying about themselves Most of CSI’s competitors have no or weakly branded messages, with minimal branding, and were delivering pure ‘product sell’. What customers are saying about CSI CSI’s role for their many happy clients is much bigger than bringing a specific software solution to a problem. The results of the process are transformative. It’s not only the creation of the best possible solution but also the creation of a team with a common goal where previously there had been people with disparate ideas. Our next step was the creation of a brand story that reflects CSI’s unique ability—a simple brand positioning statement (how we want the target customer to perceive the company, meant to be used exactly as written) coupled with key messages. We strive for simplicity in a brand story because the simpler the story is, the easier it is to communicate to an audience and, more importantly, be remembered by them. The brand story should be true to your company, relevant to the target audience and distinctive from competition. Concept Systems, Inc. is the consulting company that brings organizations working on major collaborative initiatives a superior process for capturing group wisdom from disparate points of view. Concept Systems, Inc. is the expert in Group Concept Mapping (GCM), a simple and transformative process that creates consensus on the big issue in front of the group. 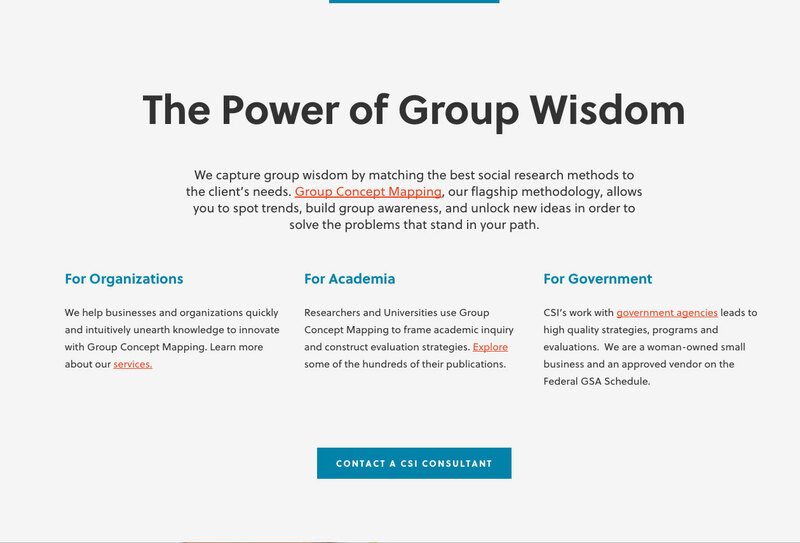 Not typical group thinking, GCM results are actually group wisdom. Group Concept Mapping creates the best possible solution, while transforming otherwise competing perspectives and the people who have them, into a single, unified framework. By combining expert consulting services with CS Global MAXTM, Concept Systems’ unique and proprietary web-based application, clients get the structure and guidance necessary to move forward – faster and more economically. Group Concept Mapping allows consensus to emerge, without individual politics or authority swaying the result. It captures and transforms stakeholder input into an entirely new group-authored creation that is the best possible solution to a complex problem. The result is Group Wisdom. Group Concept Mapping is an inclusive process. 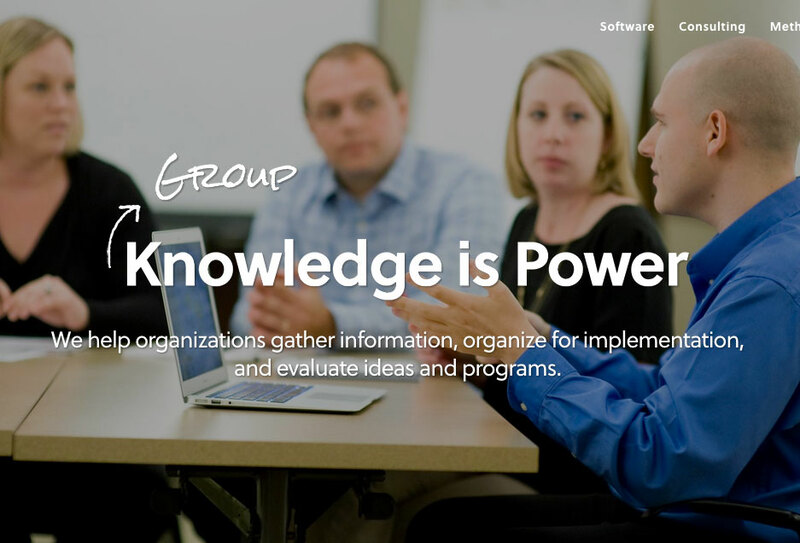 Everyone can see each contribution to the group’s knowledge at work, including their own. Stakeholders can see the essential relationships between their ideas, regardless of cultural or contextual differences. The Brand Story we created for CSI clearly defines the value customers gain with Group Concept Mapping – it energizes their clients by giving them a “roadmap” for success to address the big problem at hand. After our work together, CSI was poised to move forward with its marketing efforts to generate awareness and greater understanding of CSI among its target audiences. Their main marketing piece was their re-designed website, incorporating many of the messages and concepts described above.